Flu Vaccination – Are you ready for winter’s woes? Winter is on the way. It’s the season most associated with the hardship of illness such as influenza. Influenza or “the flu” as it is commonly called, is usually identified as a mild illness, but for children under five years of age, pregnant women, and people over the age of 65 it can be severe and occasionally fatal. “Under 12 months and over 85-years-old are the age groups most affected. They end up being admitted more than other age groups into hospital emergency departments during the flu season. The problem is that because the flu is mostly mild in otherwise well adults it is easy for them to pass it on to their kids and elderly parents,” says Dr Liz Swinburn, an emergency specialist at Royal North Shore Hospital. From April 2018, children between six months and under five years old will be eligible for free influenza vaccinations, following an additional NSW Government investment of $3.5 million to the state’s $19.5 million vaccination program. 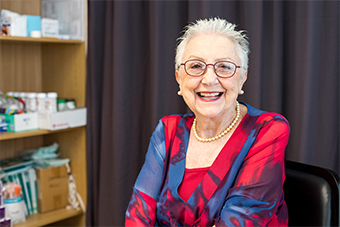 Under Federal Government funding, older Australians over 65 and pregnant women can already access the flu vaccine for free under the National Immunisation Program. 2017 was a terrible flu season in both New South Wales and the Northern Sydney area. The Northern Sydney region had a 128% increase in total influenza notifications, with 14,619 residents infected compared to 6,408 residents in 2016. (http://www.health.nsw.gov.au/Infectious/Pages/data.aspx). The flu’s fatal characteristic is reflected in the number of NSW reported influenza-associated deaths. In 2017 there were 654 influenza-associated deaths, 204% increase on 2016’s 215 reported influenza-associated deaths. (NSW Health, Communicable Diseases, Influenza Monthly Epidemiology Report, December 2017 and 2016). Given this, Sydney North Health Network is playing its part to ensure the people of the Northern Sydney region are preparing for winter’s health challenges by increasing their rates of influenza vaccination. Now, during autumn’s milder days, is an excellent time to visit your general practitioner, have a check-up and get your flu vaccination for the winter ahead.